Chemist and ceramicist, Joseph William Mellor (1869-1938) was born in England and emigrated with his family to Dunedin in 1879. He was obsessed with chemistry from an early age, and while working in Sargood’s Boot Factory, he studied at Dunedin Technical School. Mellor went on to graduate from the University of New Zealand, and gained a scholarship to Owen’s College, Manchester. He and his wife, Emma, left Port Chalmers for England in 1899; he would never return. The Mellor Collection came to Special Collections in 1945, and it includes books, manuscripts, diagrams, correspondence, and photographs, amongst other things. Emma Mellor gifted other items to various institutions in Dunedin at the same time. 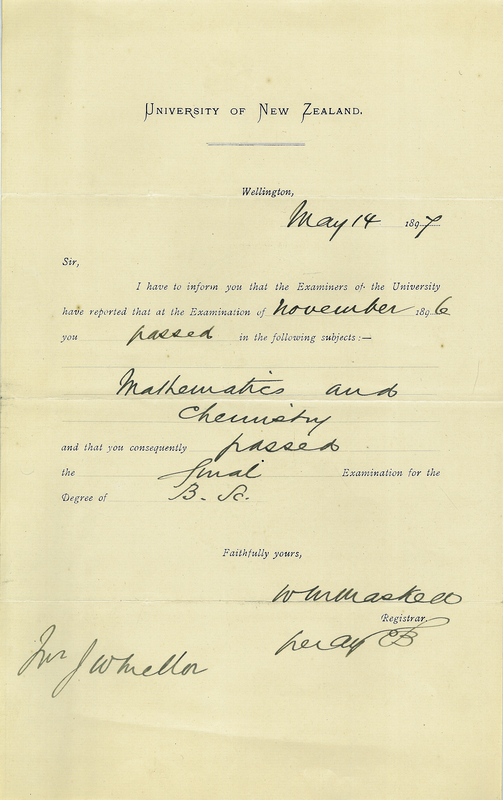 University of New Zealand, “Mathematics and Chemistry Exam Finals Pass Certificate for Joseph Mellor,” ourheritage.ac.nz | OUR Heritage, accessed April 22, 2019, http://otago.ourheritage.ac.nz/items/show/11223.